I have a lot to catch up on so I put a lot of pictures up as usual. I have been busy this week reading Twilight and New Moon. I am not a reader but I could not put the books down. I LOVE THEM! 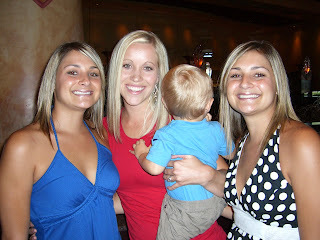 Here is a picture of me with Kristen and Brooke! They were by best friends in gymnastics when I was younger. It was so fun to see them! Kash was being camara shy. 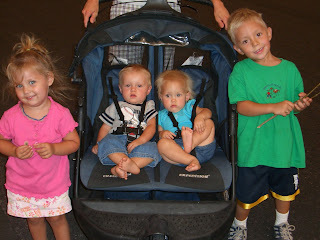 The kids all went on a walk on a stormy day and I just love this picture! 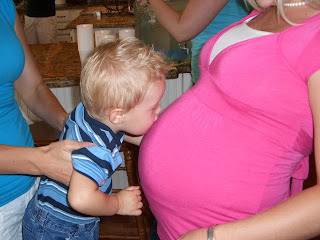 This picture is of Kash kissing Auntie's tummy. 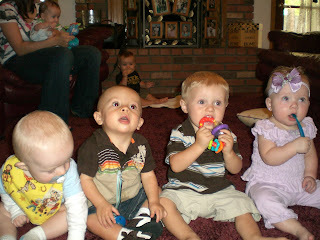 He wanted to give baby Layni a kiss at her shower! :) Kacie got so many cute things and it was such a blast with great food! 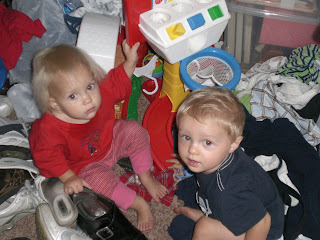 Kash and Shyre were following each other around making messes all around the house. I have so many funny pictures but this is so cute. They both look like "Uh crap we got caught!" The Girls luncheon was fun but I couldn't stay long. I did win with the most funny picture. I am not brave enough to post it! haha. 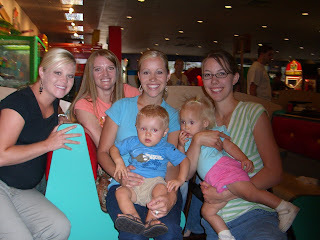 This is Ash, her boy Ethan, Bri, me and Kash Here is a picure of the girls that were at the luncheon. It was fun to see everyone! This is my favorite picture of Kash. Thanks Ash for taking it and I stole it off your blog! 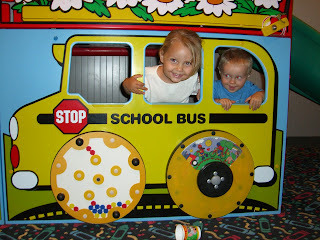 We went to meet up with an old friend Denise at Chuckee Cheese Pizza. It was so fun! 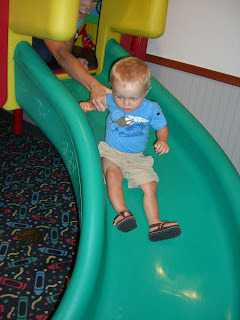 Kash loved to play on the slide and playground! So it has been so fun but Kash is still really sick with major ear problems. He is scheduled to get tubes next week but he has a double ear infection again and has been up the last 3 nights crying in so much pain. I am looking forward to the tubes and pray that I can get my sweet little boy back! Me and Tyler are going to stay at the Phoenician this weekend for his Birthday. We need a get away. So that is about all for us! Sorry about all the pictures I just love them all! hawli! cute pics. we miss you guys! 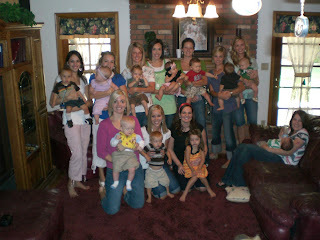 when is kacie's baby due? she looks great! I love all the pictures! We are finally back here. Let plan something and hang out. Call me 231-6167! Cute pics of the girls lunch and kristen and brooke! sounds like you have had fun things to do lately! I can't believe you went to lunch with the "twins." Even I remember them, wow time goes by so fast. Remember Robby? Just thought you would enjoy the laugh of hearing his name. We had some fun times during those carpool days. I have been busy reading all those books too I started them last sunday. Are they not the best books ever!?! hawls youre always so busy! sounds like you have quite the life though. i love all the pics. call me soon, i want to talk! You are so frickin' skinny! What are you doing? Share the love!! Hehe. You look great and your hair, i love it short! Kash...as always, mucho cutie! OK looks like you had so much fun these last couple of weeks. SO fun you went out with Kristen and Brooke. I bet it was fun to catch up. Are they still doing gymnastics at the university? You look amazing Hawls!! Hawli!!!! It's Heather!!!! I saw your blog on Alli's! Your baby's SOOO cute! I miss you! has kacie had her baby yet? how are you? i miss you! I just hang out all day with Crew. We only have one car right now so we can do something any day but Tuesday Thursday. Call me 480-231-6167. We can all go to dinner one night too...let plan something!! Hey Hawli! This blog world is so fun! 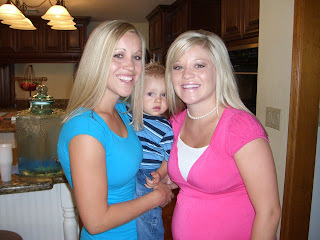 I love seeing your pics and I can't believe Kacie is about to have a baby! crazy! My husband and I are moving to AZ in Dec. He is going to ASU so we will have to hang out sometime! If you get bored and want to see some wedding pics you can go to propixs.com . . . studio list. . . Steve Nissle Photo. . Heap Turley Wedding. You and Kacie look so much alike! I love all the pictures. 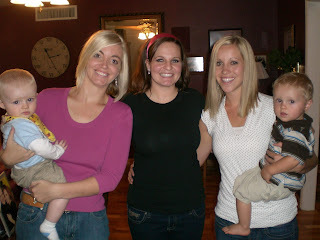 You need to help me convince Kasey and Shannon to start their own blogs! I love the hair cut. I cannot believe that your little sister is pregnant!!!! That is crazy!! She looks great and super happy! 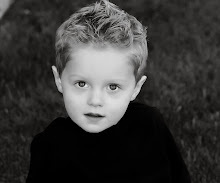 Your pictures are always so fun to look at-- your boy is growing up so fast and of course you are looking great- I love the hair! I left that last comment- I must have been logged in under Gavin's account!